I was a brownie and a junior girl scout for a total of about 4 years. 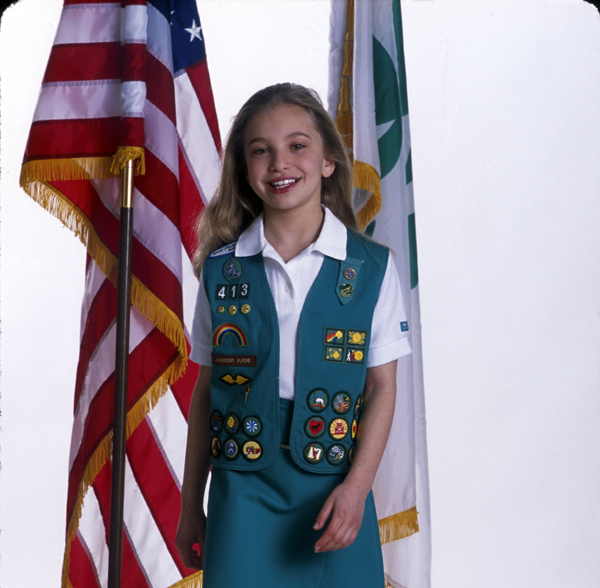 I liked the girl scouts, but I hated the uniforms. I guess mine might have looked something like that. My uniform may have been a late 1950's model though, because it was likely second hand. My badge sash. According to the sash, I can sew and embroider, and I know first aid. Not sure about the magic carpet ride or the hobo knapsack?????? When you google modern junior girl scout uniform, you find this photo. No sash here, instead a vest. This outfit is definitely a step in the right direction. It's still green but much more hip. Also better! I think the American Girl dolls have this uniform. I also found this photo on my google search of modern Junior Girl Scout Uniforms. 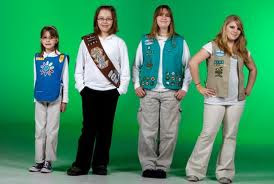 The Billings Gazette refers to these as contemporary girl scout uniforms. 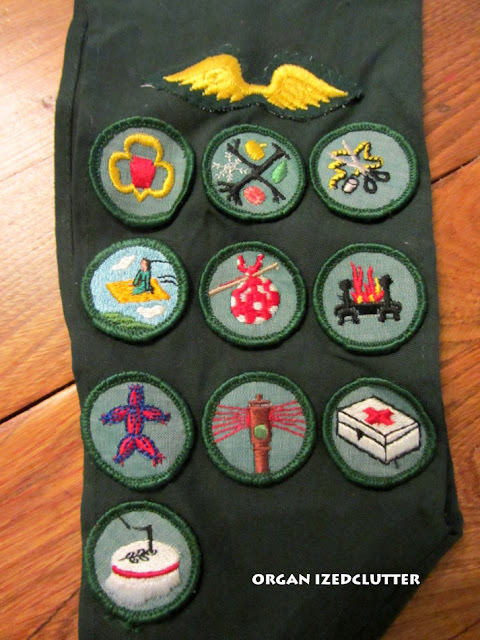 Were you a girl scout? Do you have any scouting memorabilia? I wasn't in Girl Scouts and it made me sad. My daughter was though and she loved it. You must have been wonderful by the looks of all of those badges. Oh I was definately a Brownie in the 60s and a GS in the late 60s and that was my EXACT uniform! I loved it, but I could never ever remember to ever wear it so in all our group photos there I am in my striped mini dress, black tights and white GO GO boots. Yep. I kinda stuck out, haha. This was an excellent post that brought me soooooooooo many memories. Oh, yes! I was a Brownie first, then crossed the bridge to Junior Girl Scout. I remember the uniforms well. We had so much fun meeting at our village hall, but what stands out most is the Halloween spook houses the older girl scouts would host. We were blindfolded and asked to feel the bowl of eyeballs (grapes) and worms (spaghetti). They were quite creative. I actually have my sash in a box somewhere! Oh my! I was a brownie and a girl scout! I remember making situpons on our first day of camp and of course, the "Make New Friends" song! Thanks for the memories! I was a Girl Scout! I went through all the levels Brownie to Sr Scout! Loved it and have many things I kept. Love your sash (I have one also) and I think the magic carpet badge was for reading? Now I'm curious!! LOL!! I was a Brownie scout. By the time I got to Girl Scout age, there was no longer an organization here. I loved Brownies but have nothing from it. My Mom didn't believe in keeping anything. Maybe that's why every time I see anything Girl Scout, I tend to buy it! I was a bluebird - Is that a pre-Girl Scout? Anyhoo, I loved it but they couldn't find moms to be leaders. Popped in from You're Gonna Love It blog hop. I started as a Brownie and finished as a First Class Scout!! Many, many years ago. I believe the "flying carpet" badge was for reading a certain number of books..... fun memories!! I adore these nostalgia posts!!! I did have my girl scout sash and book. Sadly they seem to have gotten lost during one of my moves. I swear we are twins! 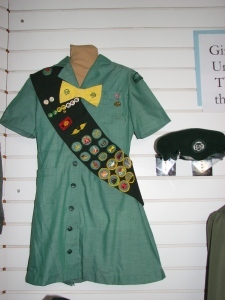 I have my Brownie sash and uniform from the 60's. And I live for Girl Scout cookie time. My favorite time of the year. You are just hitting all the nostalgia buttons with me! I'm right back to fourth grade when I see this. I did brownies when I was younger and learned to thread a needle and knot the thread. Then in girl scouts we sold cookies, went to camp, had meetings and worked, worked, worked to get badges. I thought the hobo one was for camping or was that what the fire was? I noticed some time back that it's hard to find much online about them. I have no photos wearing my uniform that I can remember, and no pictures from girl scout camp or cookie selling. So sad. I don't have my girl scout or brownie uniforms or pins either, just four badges I do remember learning about silk worms in GS and about spontaneous combustion. Those lessons stuck for some reason.